Rabbits can do a lot of damage to your garden. They'll eat your plants all year long. They tend to avoid tomatoes, cucumbers, squash, corn and potatoes. Almost everything else is up for grabs. Flowers, vegetables, trees, and shrubs are all on the menu. Tulips are a particular favorite if the deer don't get to them first. This list is both rabbit-resistant and deer-resistant. *Marks the so-called slug-resistant plants. Click here for more plants rabbits avoid. Vegetables—beans, beet, broccoli, carrot, lettuce, and peas. Tree and berry crops—almond, apple, blackberry, cherry, citrus, pistachio, plum, raspberry, and strawberry. Ornamental plants—various flowers, shrubs, trees, and turf. There's a commercial repellent product that is available now that really works. It is Rabbit Scram. Rather than a liquid spray, Rabbit Scram is a natural organic granular repellant that is effective and safe to use around children, pets and your vegetables. I’m very impressed that the owner of this company has applied a scientific approach to not only researching ingredients that work, but also why they work as well. The product actually changes rabbit behavior. As they near the applied barrier, rabbits become alert to a sense of danger. 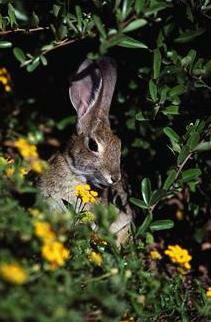 Rabbit Scram’s unique scent triggers a genetic biological defense mechanism to flee. Regular applications create a barrier 24 hours a day and won't wash off with rain as many spray repellents do. Visit the for great garden, home, kids, health, pet, and pest control products. If you have any questions about this newsletter or any other topic, join me this weekend for my Dirt Doctor radio shows.